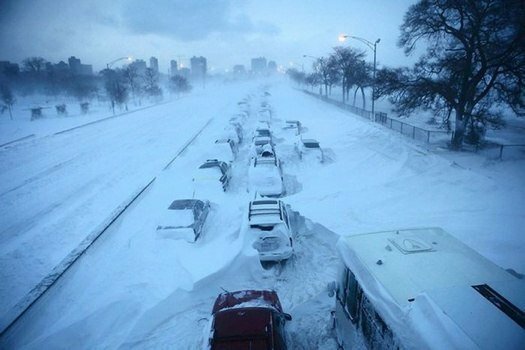 Cars got stuck in traffic on the highways that lead in and out of Kiev for two days. Many including myself happily used this opportunity to snowboard down the streets. Later I stopped by my friend’s art studio. Slavik is a sculpture artist. He had been working on this project for three days now, and cycled to the studio in spring outfit (as three days ago it was spring), before he knew the snowstorm would break out. 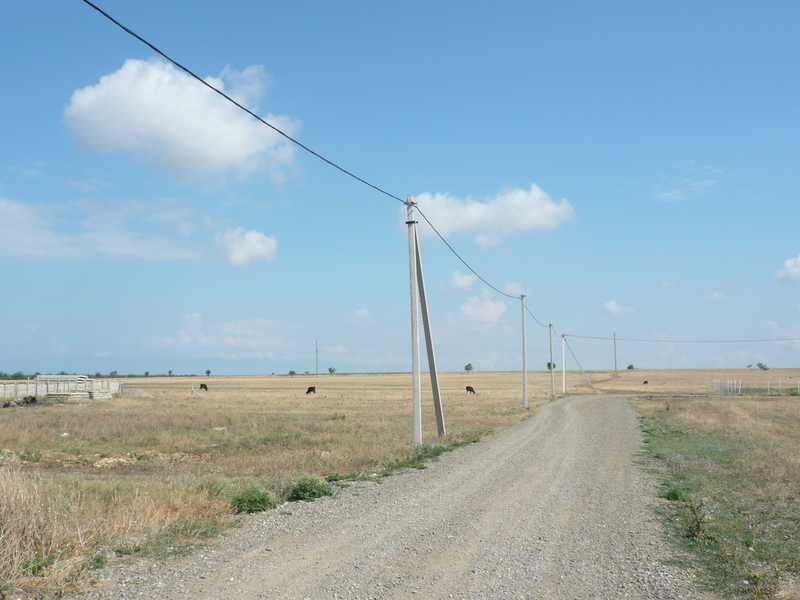 Slavik is from Odessa and these people are known to be arrogant, but also very hard-working. After locking himself up and eventually finishing the project, he realized he had to make his way home now (to the dorms, where he lived at the time). He got his bike ready. 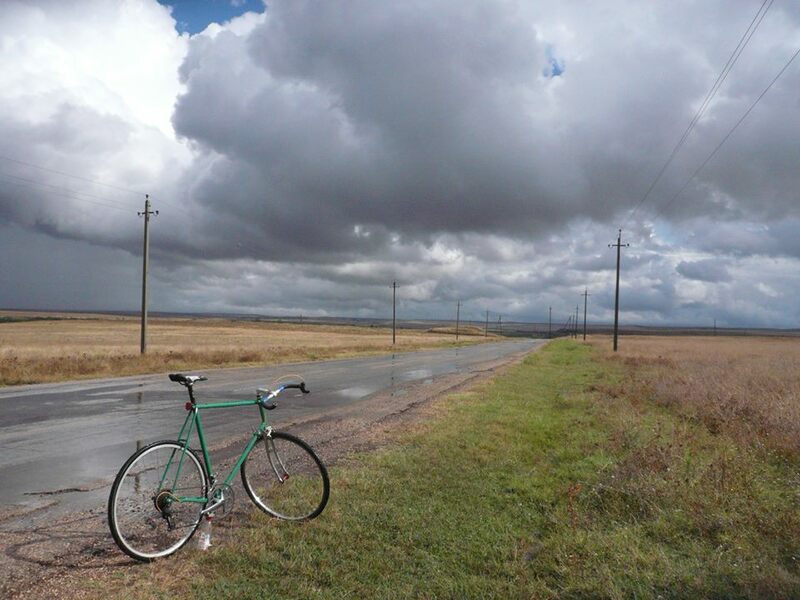 It was a nice Bianchi road bike. 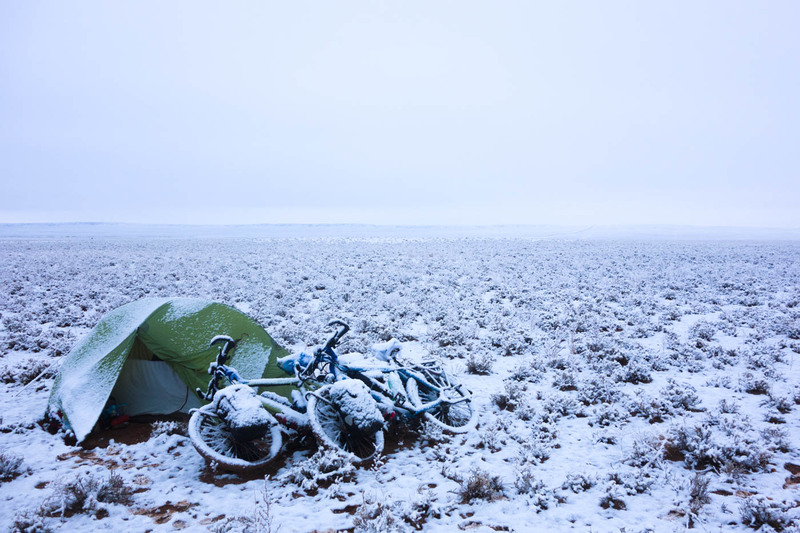 Next day he told us how he cycled to the dorms all the way through the snow-covered streets and that, even though his bike was rather sliding than riding – he made it home quicker than all those cars stuck in snow and traffic, because bikes never get stuck. I remember cycling to the presentation of my first big commissioned project with a laptop in my backpack through the rainstorm, that would challenge my eyes to even attempt open for a second (as pouring water would momentarily get in them). And then standing in front of the ‘white-collared’ customers, all covered in dirt, with that soaked laptop. But I really wouldn’t rather stay in traffic, because of some collision ahead. And of course there are those days when you get a flat tire, during that ‘I’ll be right back’ trip. You realize you have nothing that could help you to fix it, and no people around that are willing to assist. Just that group of mtb cyclists, who almost break your tube even more, by trying to use their air pump on your bike. And then you walk in your cycling shoes for an hour and a half, with only Slavik on the other end of the phone to entertain you, because his stories are always unbelievably more intense and it somehow makes you feel lucky. 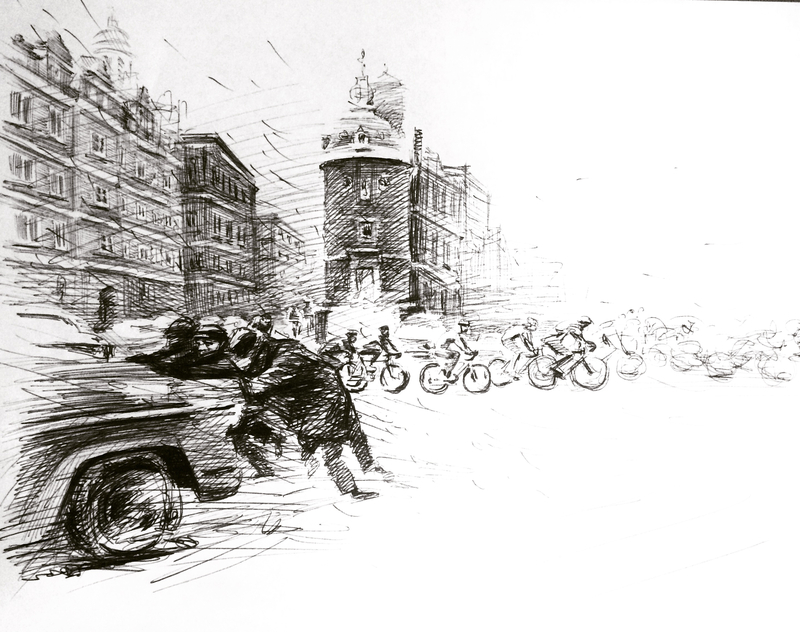 My new art series is about this impossibility to stop cycling. You just don’t stop, however out-of-this-world the circumstances around you seem to be. 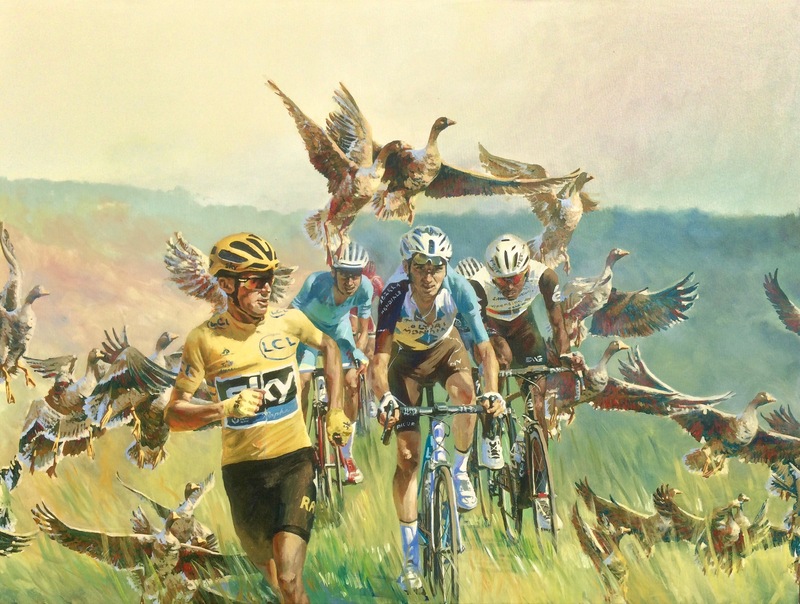 Painting above: ‘Froome Chasing Geese’ – acrylic on canvas. 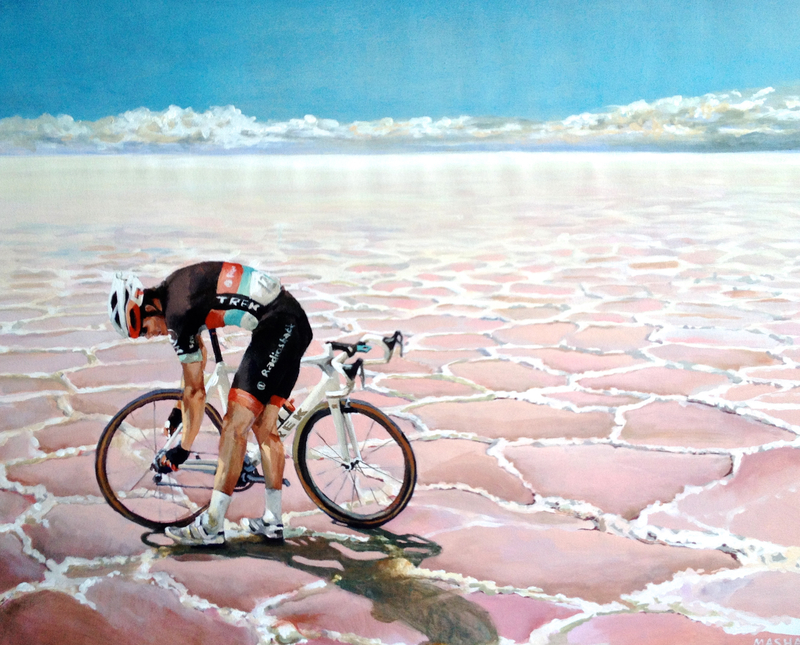 It was inspired by that stage of 2016 Tour De France, during which, after a massive uphill and nervous competition between Froome and Quitano (who was unsuccessfully trying to break away), a crash took place in the front rows of break away. It happen because of the misplaced finish line. It was high in the mountains and due to weather conditions the finish line was moved a bit down. That caused a tight crowd. A motorcycle, that was supposed to clear the way, ran into standing too close spectators and suddenly hit breaks blocking the cyclists. Froome got left without his bike as it was broken. Without further hesitation he started to run to a finish line, that was just around the corner. It reminded me that feeling of chasing geese when you are a kid and you are running for life. Also I was inspired by that book ‘The Wonderful Adventures of Nils’, that I remembered from childhood. Paintings above: series ‘Chasing The Pink’ – acrylic on canvas. 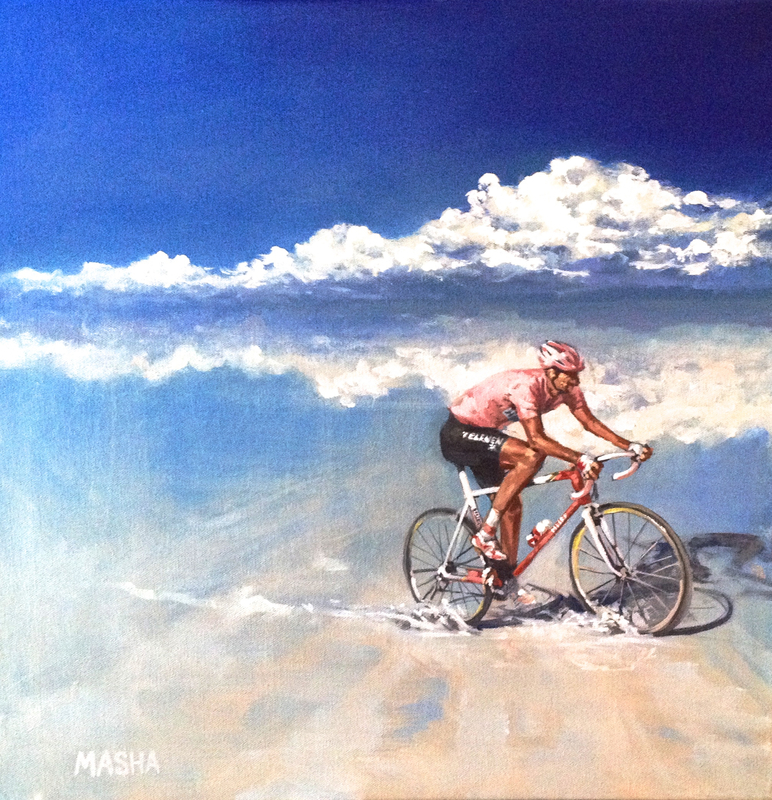 They are dedicated to chasing the dreams (the allegory is a reference to the pink shirt of a champion of Giro d’Italia). Read more about the creation of the painting above ‘Sky is the Limit’ in my previous post. 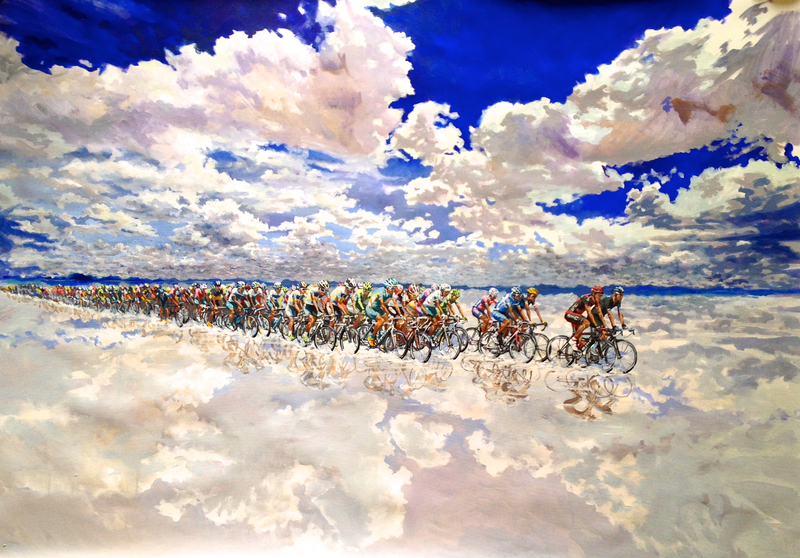 The new painting, I am currently working on, explores the absurdity of cycling situations. In this case it’s cycling through snow, no matter what. See the sketch below. Follow my blog and Instagram to see the finished painting. See more sports related paintings here.